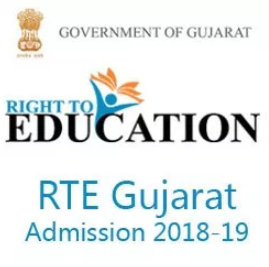 The Government of Gujarat Education Department has released notification or circular about an RTE admission in Std – 1 as Right To Education Rules and Regulation. All the students who apply for RTE admission, will get 25 % off for reservation in RTE admission in various private schools of Gujarat. we advised to all the students who apply for the RTE admission visit the page constantly to check updates and get information or notification regarding it. Eligible students may apply for RTE admission, firstly read the full advertise and apply for it. The students who are eligible and interested, can apply online RTE Gujarat Admission 2018/19 at official website www.rtegujarat.org of the Government of Gujarat Education Department. This RTE admission is beneficial scheme for the weak and who are from low category students, that is free for all the eligible students. Through Government of Gujarat The Right of Children to Free and Compulsory Education will publish in Non Government school for admission of eligible students. The children who has completed 5 years till the 1st June, 2018, can apply for the RTE Admission in non government school. SC, ST, SEBC and General categories students who has BPL card. 1,20,000 grant for the student who lives in village. If Sc, ST and SEBC student lives in City then he/ she get 1,50,000 grant. Children’s Parents have to visit the official website www.rtegujarat.org to apply for the RTE admission between date 19/04/2018 to 05/05/2018. The eligible students can use RTE Admission centre where application form was accepted to apply for the admission. The Parents who are not fill up the application form at online, that can use this centre for RTE admission. We advise to all the parents, must take the print of filled application form for the future use and that print attach with documents and submit to the RTE admission centre for the offline verification. Address Proof : As a address proof, you can submit the Electricity Bill or Aadhar Card or Passport or Water Bill or Voter Id or Driving License or Ration Card or Notarised Rent Agreement. Parent’s Caste Certificate : This Certificate registered from Mamlatdar, Social Welfare Officer, Taluka Development Officer or Competent Officer. Birth Certificate : This certificate registered from Gram Panchayat, Nagar Palika, Maha Nagar Palika Anganvadi, Balvadi. Parent or Guardian’s Notorised Affidavit. Photograph : Passport size colour photo with white background. Parent’s Income Certificate : Income certificate certified from Mamlatdar, Taluka Development Officer or Competent Officer Certificate. if that is new income certificate so certified from E-dhara center. BPL Card : Must Require BPL card. NDNT : This Certificate certified at Mamlatdar, Social Welfare Officer, Taluka Development Office. Orphan Certificate : This Certificate Certified by Child Welfare Committee (CWC). Child in Need of Care and Protection : This Certificate Certified by Child Welfare Committee (CWC). Children belonging to Child care Institution : This Certificate Certified by Child Welfare Committee (CWC). Child Labour Certificate : This Certificate certified by Labour & Employment Dept. Mentally Challenged Child Cerebral Palsy certificate : Required Civil Surgeon Certificate. CWSN : Required Civil Surgeon certificate (minimum 40%). Certificate HIV affected Children : This certificate is for Children who are HIV affected children. Children Of Martyred Soldiers : This Certificate is of authorised person of related department. Child Aadhar card : Required Aadhar card of applicant (child). Parent’s Aadhar Card : Required Aadhar card of child’s parents. Bank Details : Required copy of Bank Passbook. First of all visit the official website www.rtegujarat.org. Then click on the Online Application tab. Then click on the tab New Admission. Now you will seen the Application form with some required field. Fill up all the important details regarding RTE admission, in which you must choose the school for the admission. Then click on the submit button to confirm your application. Then your application form will be submitting. Then Application number will be generate and you will get it. Take a print of application form for further use. Print and document will submit at the receiving centre. The application form will go for approval at the DEO/ DPEO office. Then online seat allocation will be done as per parents choice. Download your admit card from the website and take a print. Then visit the school with admit card and necessity document where you get seat. How to Check Status of RTE Admission Application ??? By using following steps you can find your application current status of RTE Admission, You can see in below image. Firstly, Go and visit this Link. Then after you will seen the page which have some information. Now enter the Application number which already you have. Then enter the DOB (Date of Birth). Now you can see your application current status. This RTE Admission procedure has total 1,42,758 confirmed application form for RTE admission in which 1,28,881 Application collected by RTE Admission Centre. Mostly uneducated peoples were applied at RTE Admission centre for RTE Admission. Through DEO/ DPEO has approved 1,25,729 Application. Remain application was cancelled due to different reasons. In Gujarat 9867 non government primary schools which has 1,12,591 seats by RTE acts as 25 % off for admission in standard 1. Online form will be distribute at date 18th May, 2018 to all the blank seat of registered school. The Government of Gujarat Education Department distributes seat for the student at 80199 seat under the RTE act. RTE admission based on the parent’s income and parents selected school near by 6 km. By Government of Gujarat Education Department has allocated seat in 80199 school under the RTE act. The parents will be get message regarding seat allocation by government of gujarat education department. district information put on DEO/DPEO login and verified login. also district information put on the school login. we advise to all the selected student download your admit card till 26/05/2018 and attach with the required document and submit to the school. The school should login dashboard and click on the pending students icon and then click on the admin button. Then scan your document and upload all the documents. if parents have any complaint regarding RTE admission, it will submit to the RTE Admission centre then its resolve by the government of gujarat education department.